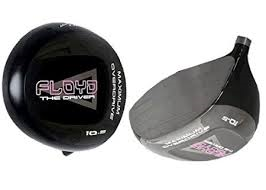 Introducing The Fugazi….Floyd The Driver!!! Right Hand Only. The Floyd has a perimeter progressive recessed soleplate (Floyd logo area) to promote more ‘heel/toe’ weighting for off center hits. Very high MOI. 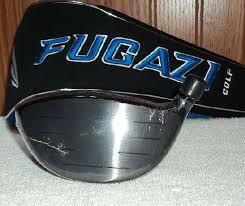 The soleplate design area will also promote a slightly lower trajectory and lower spin. But, the main reason for the design was to help, considerably, in off-center hits. In other words…more forgiveness! On the looks department pics do not do it justice…this thing is gorgeous in person! over TiCN Buff sole indentation area. Steve Almo started Geek Golf in September of 2005 with the idea of making unique and high performance golf clubs. Steve Almo has built a solid reputation as one of the most unique designers of golf clubs in the industry. With over 35 years in the golf business working in both ‘on the road’ selling and in Sales Manager capacity for many well known companies including RAM Golf, Sounder Golf, Stan Thompson Golf, NorthWestern Golf, Ray Cook Golf, Don Martin Golf, Dexter Golf Shoes, MunsingWear Tour Clothing, Sellers Golf, Silver Fox, Hagger Clothing (Golf Division), Integra Golf and creating and co-founding BANG Golf. Almodesigns and Geek Golf have won 17 RE/MAX Championship Titles Worldwide since Geek Golf started in 2005…more than any other golf company! Almodesigns have also won 1 PGA Tour Sanctioned event and have or are being played on every Major Tour around the World including The Masters, The Bell South Classic, Dunhill Cup and winning Overseas Professional Golf Tournaments. Almodesigns and Geek Golf have also set 5 LD distance records worldwide! Steve has now created GEEK Golf for the ‘rest of the world’ and you know who you are! “My best design work will unfold as GEEK Golf and AlmoDesigns continue to dominate as a leader in ‘originality and performance’ enhanced golf products!” Don’t you think it’s time for YOU to “Raise Your Geek Flag High”? 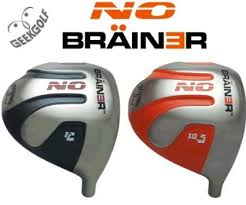 Inspired by Muscle Cars, Geek Golf Introduces A True Muscle Head…The No Brainer!!! Due to the distinct placement of extra weight incorporating the design characteristics of the sole and body of the NO BRAINER…this is truly a ‘Muscle’ head…hence the tie-in to Muscle cars!The Aerodynamics of the body works to enhance the unique weighting design of the sole of the club. The sole weighting runs from ‘heel to toe’ directly behind the face which then extends in 3 weighting configurations going from the front portion of the club sloping to tapered positions to really increase the MOI and drop the COG further back and upward without utilizing a ‘skirt’ on the sides and back portion of the club which in turn applies more weight where it will do the most good.The design positioning of the added weight lowers ‘spin’ and increases ‘ball speed’ dramatically. Look for tremendous carry and tons of roll out with the NO BRAINER…Steve Almo, of AlmoDesigns was recently quoted…”anyone can add weight to a head…you MUST incorporate the added weight into the design characteristics for optimal performance. Where you put the added weight to increase performance is key. I worked on this design for the better part of 2 years…it‘s a Monster Killer”.